EVANSVILLE, Ind.--Indiana's economy was a focus of Pres. Trump's address to a capacity crowd at the Ford Center in Evansville, Thursday night. As the president spoke inside, the street outside was full of people who waited to get in, but who didn't get the chance. Some protesters were also outside, and one was inside. "Where the hell did she come from?" asked Trump as she was escorted out, saying he believed the media would dishonestly report that protesters were everywhere. "We are putting your great Indiana coal miners and steel workers back to work<' said Trump. He said he spoke backstage with several miners. "Now these were tough guys, seriously tough cookies. In fact I looked and I said I wouldn't want to fight these guys," he said. "Of the nine, eight of them were crying, crying out of happiness because they're back. I said 'what's wrong with you, why aren't you crying?' 'I don't cry, sie!' I said, that's okay." Trump said he believes tariffs have worked. He cited examples like U.S. Steel's new commitment to keep jobs in Gary and open seven new plants. 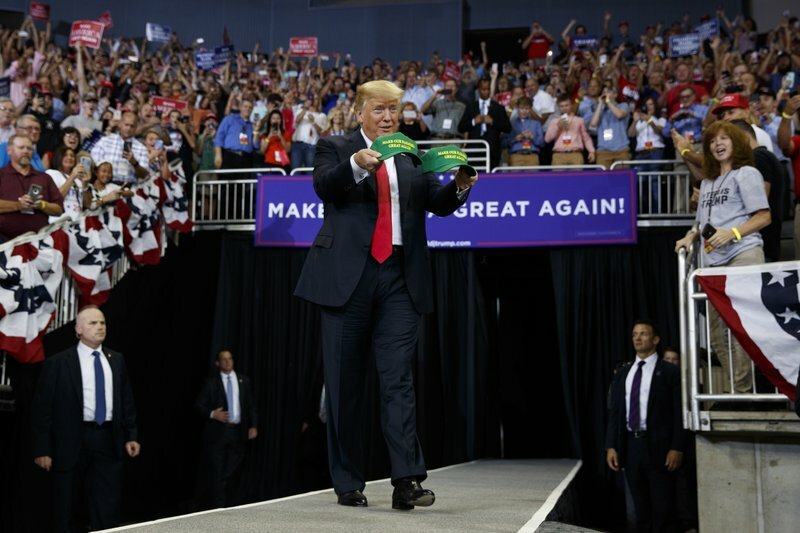 Trump said he believes the new deal with Mexico, which he describes as replacing NAFTA, will make the economy even stronger. "So, we made a great deal with Mexico. As you know, Canada didn't want to do what we have to have done. And, after the deal was made with Mexico, Canada came along and they're negotiating right now at the White House, at our territory," said Trump. While the majority of his speech dealt with the country's economic situation, Trump took a few minutes to praise Indiana's governor and Republican leadership. He also took time to criticize Sen. Joe Donnelly, a Democrat, and shared the stage with Donnelly's Republican opponent, businessman Mike Braun. Braun and Trump both talked about Donnelly's decisions and Braun led the crowd in a chant of "Joe's gotta go". Trump was critical of the media, saying 85 percent of them (journalists) are "dishonest, terrible people". He then turned his attention to the Dept. of Justice and the FBI, saying he believes both have bad leadership, and are not investigating the right things, like Hillary Clinton. "Our Justice Department and our FBI have to start doing their jobs and doing it right and doing it now, because people are angry. People are angry. What's happening is a disgrace and at some point, and I wanted to stay out, but at some point if it doesn't straighten out properly I will get involved and I will get in there if I have to," he said.